When winter creeps in and the damp weather starts to take effect, there’s nothing worse than cold, wet feet to make you feel terrible. So what can you turn to that will keep you warm, toasty and dry as well as looking effortlessly stylish? A great pair of long leg boots of course! From heeled long leg boots with a pointed toe, to a more robust lace up military style boot, there’s something to suit everyone and every occasion. 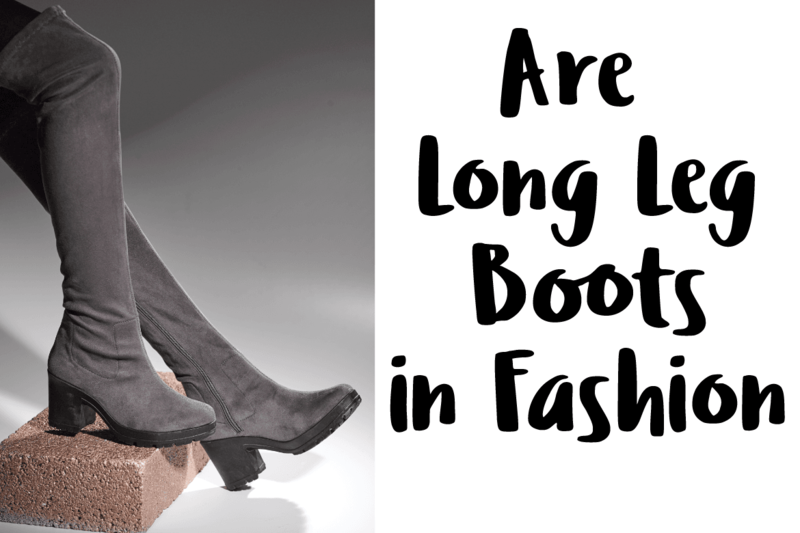 But are long boots in fashion? Short answer… Yes! Knee high boots are a winter wardrobe staple and every woman should own at least one pair as far as we’re concerned. Super versatile and incredibly cosy, they’re perfect for dressing up or down with so many different styles to choose from, including Brit chic perennial riding boots. A good pair of boots can be timeless, so provided they’re looked after, they can last for years and will never go out of style. If you fancy raising the style stakes, then you should definitely give over the knee boots a try. 2017 saw a huge surge in popularity for this retro favourite and not only are they a stylish alternative to knee high boots but they’re incredibly flattering too. The perfect choice when you want to slim down your legs without wearing black tights. Pleated Skirts – First thoughts about pleated skirts will probably be mixed and they’re likely something that you’d associate with your 80 year-old neighbour… But they’re so hot right now! A silky, midi length pleated skirt in a muted colour can be teamed perfectly with a delicate pair of knee high boots. Perfect if you’re looking to keep things feminine and glamorous yet want to protect against the elements. Skinny Jeans – Having a go-to pair of skinny jeans is a must. Not only are they perfect for everyday wear but they can easily be dressed up too. Invest in a few pairs in different neutral colours such as black, grey and indigo to help you mix and match with the rest of your wardrobe. TOP TIP: tuck your jeans into your socks before putting your boots on as it will stop them from riding up. Shorts – A bit of a weird one you might think when we’ve just been talking about protecting yourself from the elements. Shorts can, however, be the perfect choice when choosing thigh-high boots. Opting for high-waisted shorts will also help to lengthen your legs. Dresses – Both casual and tailored dresses can look great with knee-high boots and thigh boots alike. A smart pair of simple black block-heeled boots can be perfect for the office, as well as being comfortable and stylish. Add a pair of tights to your outfit if you want an additional layer for warmth. Oversized jumpers and shirts are a really big deal at the moment too. Amazingly comfy, they make the perfect casual mini-length dress. Add a skinny belt and team with an unstructured pair of over the knee boots for a chic, bohemian look. 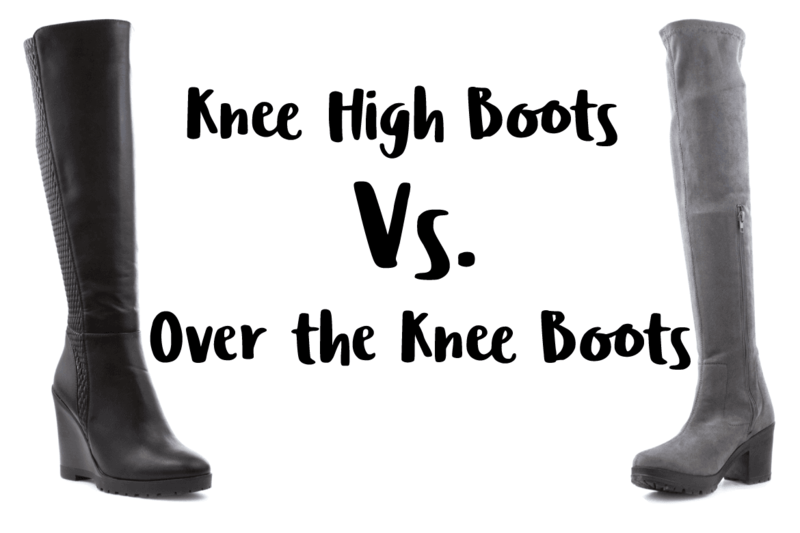 Knee High Boots vs Over The Knee? This is a tough one as they both have their place in our hearts and we definitely think they should in yours too. Knee-high boots are versatile and timeless, over-the-knee boots are stylish and edgy. If you want a casual pair of boots that are practical and comfortable, knee-high boots are probably the best option for you. Soft leather knee-highs with a flat sole are a great choice when wandering around the shops or when it’s your turn to do the school run. As we’ve mentioned before, knee-high boots can be glamorous too; opt for a patent or polished finish and a stiletto heel and you’ll be ready to party the night away. If stiletto heels aren’t really your thing, try a kitten heel instead. Over-the-knee boots on the other hand are very fashionable right now. A vintage suede finish with contrasting block heel will have you channeling your inner Kardashian in no time! TOP TIP: Choose a pair with a cleated sole for added grip this winter time. 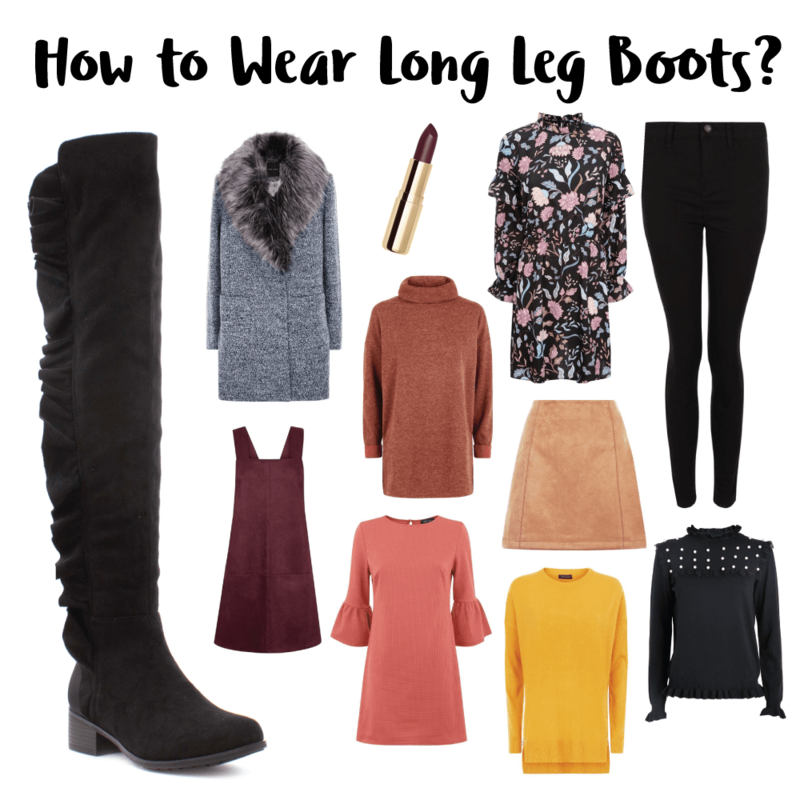 If you’re looking for long leg boots that are suitable for wide calves, go for a stretchy pair which will give you the added room you need without losing shape. If however you prefer boots that are more rigid, look for those with an elasticated panel on the inside of the leg, these will give just enough give to fit your legs perfectly. We love a good pair of long boots, but we love a nice pair of ankle boots too. Much like knee high boots, ankle boots come in a variety of styles with varying heel heights and types. Ankle boots are great if you want something that easy to put on and take off, particularly Chelsea boots which can be just slipped on and off due to the elasticated gussets on either side of the boot. They also the perfect choice if you want to keep your outfit sleek and understated, and they go perfectly with skinny jeans and dresses alike. A style that’s particularly on trend this season is sparkle ankle boots. 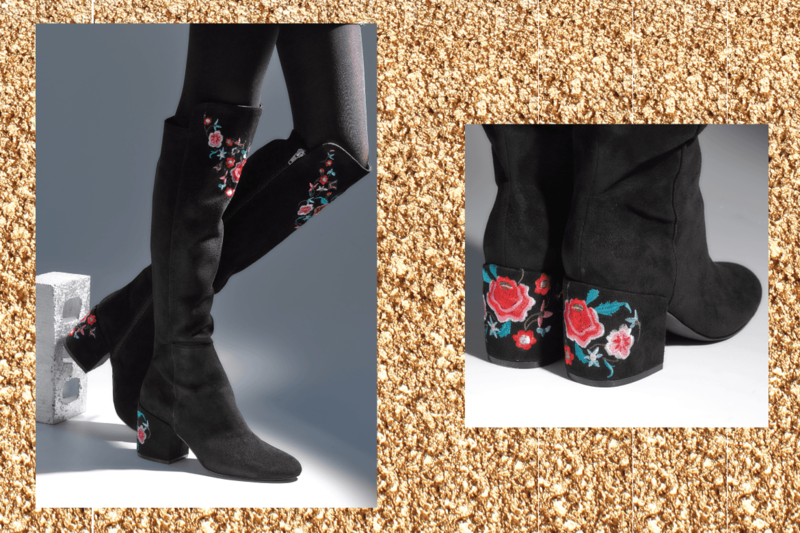 If you’re looking to swap your party shoes for something a little more protective without compromising on the glitz, then a funky pair of glittery boots are the choice for you. If you want to get your pins out or you’re looking for a pair of boots that are less restrictive around the legs, ankle boots are a winner. 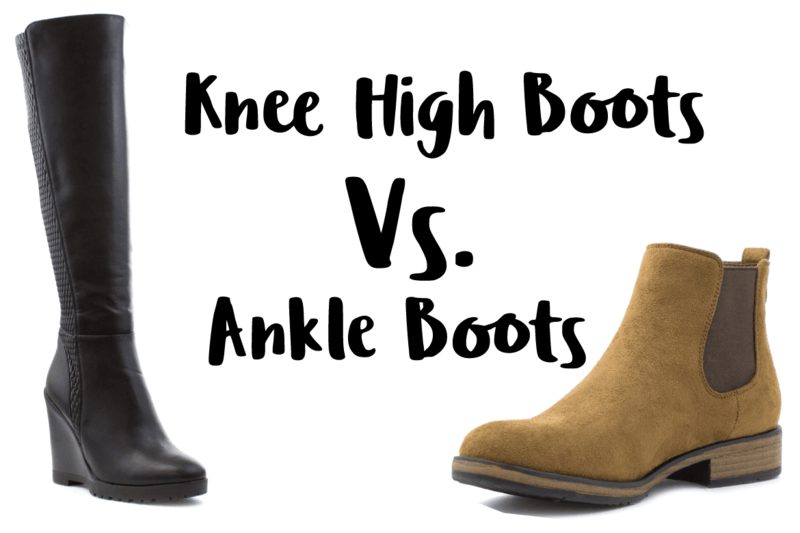 The downside to ankle boots however, is that they don’t offer the same level of protection as knee high boots so may not be a suitable choice for all weather conditions. If you’re looking to invest in a new pair of winter boots, there’s no better time to do so. With heaps of styles and types to choose from this season, there’s a good chance you’ll even be spoilt for choice (or buy them all so no pair feels left out!). Whether it’s knee-high boots or over-the-knee that you fancy, we’re certain you’ll love them unconditionally like we do!